‘As the global financial crisis surfaced in 2007, we journeyed for 7 months across Europe to investigate and experience examples of post-capitalist living – from a direct action Climate Camp set up illegally on the edges of Heathrow airport to a hamlet squatted by French punks, an off grid low impact permaculture community too ccupied self-managed Serbian factories, a free love commune in an ex Stasi base to a farm where private property had been abolished, we shared di erent ways of loving and eating, producing and sharing things, deciding together and rebelling. We were not looking for escapist Neverlands, blueprints for a perfect future or universal systems, but communities who simply dare to live di erently, despite the catastrophe of capitalism. 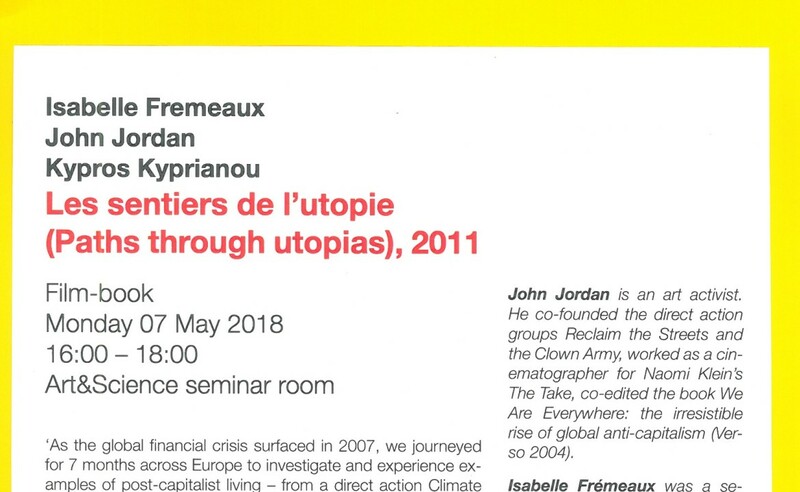 In the next Artscience practises session we want to watch and discuss excerpts of the film ‘Les sentiers de l’utopie’ (Paths through utopias), 2011. The film was published as a Film-book in French and in German. The film is available with English subtitles and I will try to add a bit from the additional information in the book. We plan to watch the part where they visit Longo Maï in France and some of the other destinations. John Jordan is an art activist. He co-founded the direct action groups Reclaim the Streets and the Clown Army, worked as a cinematographer for Naomi Klein’s The Take, co-edited the book We Are Everywhere: the irresistible rise of global anti-capitalism (Verso 2004). Isabelle Frémeaux was a senior lecturer in Media and Cultural Studies at Birkbeck College-University, London, until she resigned in December 2011 to escape wage labour and academia. Her action research explores popular education, storytelling and creative forms of resistance. Together they co-founded the art activism and permaculture collective The Laboratory of Insurrectionary Imagination (www.labofii.net) whose infamous interventions continue to erupt across Europe. In 2011 they publishedthe book/ lm Paths Through Uto- pias (La Decouverte,2011), after which they set up the community la r.O.n.c.e (Resist, Organise, Nourish, Create, Exist) which lies 70kms from la ZAD, the autonomous area in resistance on the site of the planned Notre-Dame-des-Lande’s airport.